Hybrid cloud architectures are currently very popular as a way for enterprises to move to the cloud without abandoning their existing data center investments. At first glance, the strategy makes sense, but there’s a very real danger that the hybrid cloud’s popularity will turn out to be little more than a transitional stage, potentially distracting companies from optimizing either their on-premise data centers or their migration to the cloud. Making things more complicated, the term “hybrid cloud” can have a number of meanings, but at the root it covers any combination of traditional and cloud architectures. That can mean anything from a traditional data center shop running a couple of non-strategic, standalone applications in the cloud to complex architectures with some core applications residing on-premise and others in various cloud implementations. For this post, I’m basically talking about the latter approach, where you have to create systems and process that optimize both sides of that equation. It’s not always easy to do either one, and—critically—excelling at both the cloud and the data center often requires very different skill sets. The deep technological knowledge needed to run a modern data center may not overlap much with the brokering and management expertise needed to successfully work with cloud vendors—especially in multi-cloud environments. Of course, all this doesn’t mean there’s no place for the hybrid cloud. The approach is pretty much necessary during the transition from legacy data centers to the public cloud. And some enterprises will always need to maintain a foot in both camps. But there’s a risk that thinking of the hybrid cloud as some idealized end-state for your infrastructure and applications could end up leaving you with the worst of both worlds. 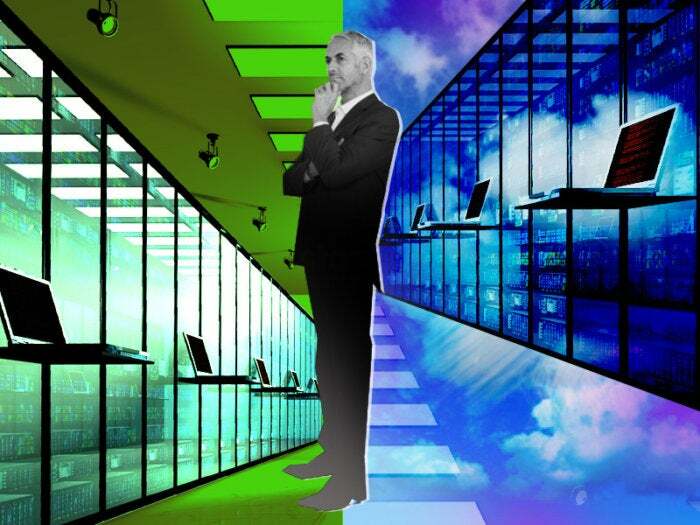 Hybrid cloud: The worst of both worlds? On one hand, you have the expense and capital investment of operating your own data centers, but without the complete control of your data and processes that is one of the key benefits of on-premise technology stacks. On the other hand, you’ll have to deal with the complexity and potential of working with third-party cloud providers, without gaining much of the cloud’s promised benefit of freeing your team to focus on innovation instead infrastructure. In many instances, enterprises might be better served over the long term by emphasizing one area or the other. Companies that really want to move to the cloud would be well served to move as much as possible—if not all—of their data center activities to the cloud as soon as practical. But, if for whatever reason they’re not ready to fully commit to the public cloud for the next few years, there’s a strong argument for doubling down on running their own data centers, and using the cloud only for simple, completely separate applications. Heck, they can still call their approach “hybrid cloud” if they want, while avoiding as much of the potential complications as possible. And then, at some later date, if and when they are ready to go all in on the cloud, the path could be simpler and more straightforward than trying to get there one step at a time.